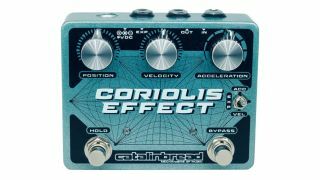 NAMM 2019: Catalinbread has launched The Coriolis Effect pedal, a pitch and filter multi-fx that moves between effects pulling in elements of a wah, pitch-shifter, harmonizer, sustainer and low-pass filter. Its namesake, the Coriolis Effect, is a scientific term given to a force that alters an object's trajectory within a rotating frame. Without going too far down the physics rabbit hole, it is often used to explain the movements of large scale weather systems on the earth's rotating surface, or the direction of the centrifugal force that swirls the water in your sink. As far as we can make out then, Catalinbread's new pedal works by rotating the proportion of each effect you hear depending on how you manipulate the Velocity and Acceleration controls (which alter the pitch of the wet signal and a low-pass filter, respectively). Turning them both down will lower the pitch and cut high-frequencies. 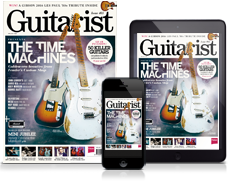 Pressing the hold button loops the current signal (with up to two minutes of sustain), while an expression pedal input allows you to manipulate parameters on the fly. Under the hood there is an internal bypass switch (for a choice of true or buffered bypass), an expression pedal polarity switch and an internal gain trim. As usual with Catalinbread, it's handmade in the US. The MSRP for The Coriolis Effect is $229.99.